Red Rocks Park is a unique transitional zone where the Great Plains meet the Rocky Mountains. 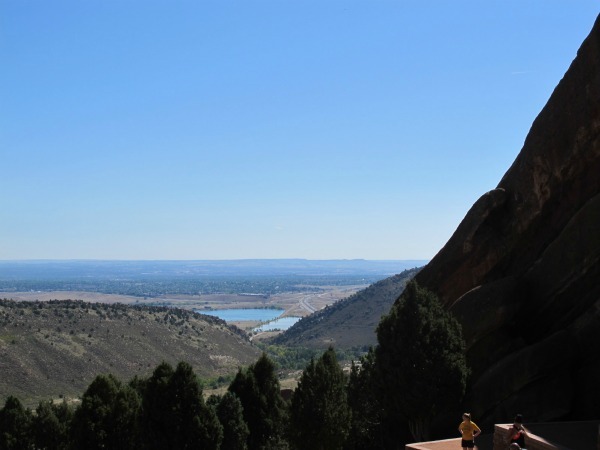 The Red Rocks Amphitheatre is located in Red Rocks Park near Morrison, Colorado, 15 miles west of Denver. The famous amphitheatre is known for the unobstructed view of the stage and perfect acoustics in every seat (all 9,450 of them.) Entertainers like the Steve Miller Band, Lyle Lovett, John Prine, and Nitty Gritty Dirt Band have played here. More than Mother Nature’s acoustical marvel, Red Rocks also offers visitors the opportunity for biking, hiking, an Easter Sunrise Service, art and photography opportunities galore. Concerts – This amphitheatre is the only naturally occurring, acoustically perfect amphitheatre in the world. Musical legends such as Sting, The Beatles, and U2 have performed in the amphitheatre. Hiking, Biking and Exercise – Red Rocks Trail (1.4 miles) starts at the lower north lot and is used for hiking, horseback riding and mountain biking. Hiking and Biking trails can be printed out from the website. Visitors are cautioned to stay on trails and watch for rattlesnakes. Many people use Red Rocks as an exercise venue. All guests are cautioned to remember that at this high altitude (6,450 feet above sea level) there is less air. As you climb a mountain, the air gets thinner. Use sunscreen and drink plenty of water. Other Events – mark your calendar, details coming soon. Easter Sunrise Service, Sunday, April 08, 2012, 6:00 AM. Check website for more details. Snowboard On The Rocks, Saturday, September 15, 2012, 6:00 PM Check website for more details. We arrived just as a wedding was taking place. The views are unforgettable and the park even has catering service. While walking to the amphitheatre, we saw a rattlesnake on the trail. (Remain calm and step back slowly.) 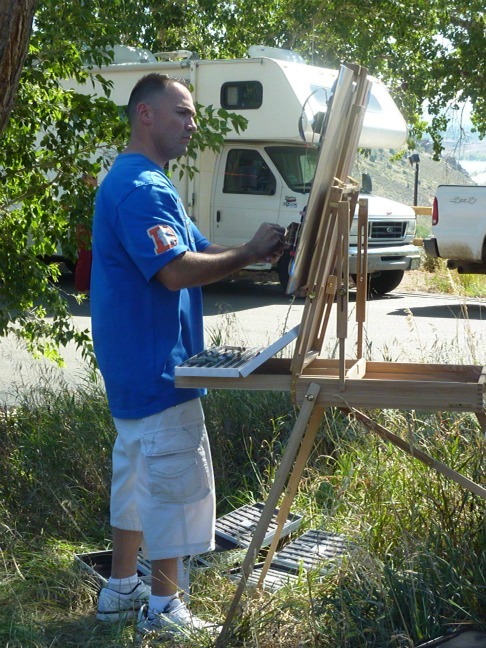 A dozen or more artists were painting, sketching or taking pictures that sunny Sunday. The Ship Rock Grille and The Trading Post gift shop are at the Visitor Center. My best advice – always bring hiking boots and a camera everywhere you go in Colorado. 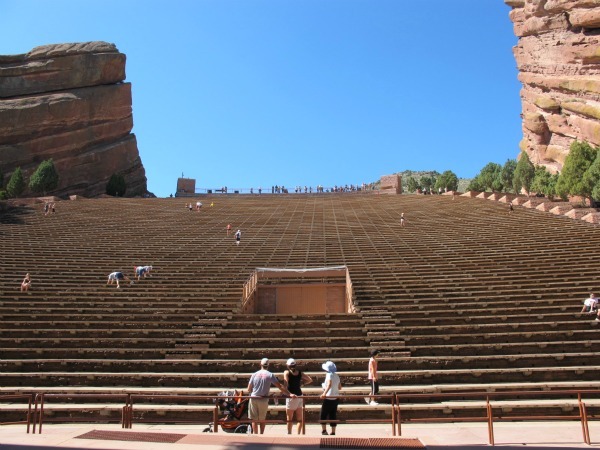 Details – Red Rocks Amphitheatre & Visitor Center, 18300 West Alameda Parkway, Morrison, CO 80465, Phone: 720-865-2494, Fax: 720-865-2467. Park and Amphitheatre Hours: The Park is open from 5AM to 11PM, daily free of charge. In the event of a performance the Amphitheatre and Visitor Center will generally close to the public in the early afternoon hours. More to See – Coors Brewery, 13th & Ford, Golden, CO 80401, Phone:1-800-642-6116. The brewery experience includes a 30-minute self-paced tour highlighting the malting, brewing and packaging processes. Afterward sample the beers for those 21 or older with a valid ID. You might also like – Striped Pot Buffalo Bill’s Wild West memorial museum and grave. Dinosaur Ridge Denver Daytrip See some of the most famous discoveries including Apatosaurus and Stegosaurus.